I’ve said it before and I’ll say it again, a cast-iron skillet is one of the best investments you can make for your kitchen. That and a proper chef’s knife! Most cast-iron pieces of cookware are extremely affordable and, if you take proper care of them, will outlast you. 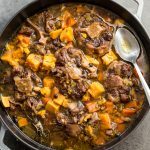 They are absolute workhorses that can tackle everything from searing the perfect steak on the stovetop to roasting a beautiful chicken in the oven and just about everything in between (with a few exceptions, of course). I’m not a betting man but I’d be willing to wager that you’ve probably heard others extoll the virtues of cast-iron. Perhaps more so than any other material of cookware. Yet trailing behind those lofty praises is a caveat: “cast-iron is a nightmare to clean and take care of”. Despite the warning, you actually bought yourself a cast-iron skillet! 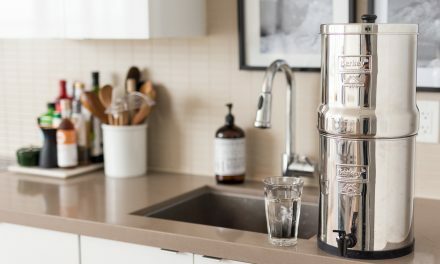 It’s now tucked away in some dark corner cabinet in your kitchen because you’re too afraid to ruin it! Or, better yet, you used it once, had your eggs stick all over it and gave up hope altogether. Am I right? People of the internet, I’m here to tell you that seasoning your cast-iron skillet is not difficult and it is absolutely nothing to be afraid of. Yes, it takes a bit of time, energy and elbow grease, but by no means does it require a PhD, MA or even an Honours BA in Arts (all of which I happen to have and none of which have made me better at seasoning my beloved pans). My college diploma might be the only degree that actually helps me with my cast-iron maintenance. After all, it’s the most ‘practical’ one! Get it? Ah, whatever. So you’ve got your cast-iron but you don’t know what to do with it. You’ve trolled the interwebs seeking advice to no avail, probably because everyone says something different. Like many of you, I find it so unbelievably frustrating when I come across convoluted advice on how to season cast-iron. Why? Why does everyone have such polarizing tips, techniques and methods? Who knows? Who cares? I’m here to solve those dilemmas (or fail miserably in the process)! Before we get down to brass tacks, I should mention the structure of this blog post. I’ve broken things down into different parts because even though seasoning cast-iron is not difficult, people often get it wrong because they don’t understand why they’re doing what they’re doing! My hope is that with a bit of background information, you will be able to get a better grip on how to care for your cast-iron. It is important you read through the below because otherwise I’ve spent the better part of a week writing all these words for nothing. 1. What is Cast-Iron Seasoning? 2. Initial Seasoning vs. Maintenance. 3. How to Initially Season Cast-Iron. 4. How to Maintain Cast-Iron. 5. Cast-Iron vs. Enamelled Cast-Iron. 7. Best Oils to Season Cast-Iron. ‘Seasoning’ refers to the reaction of bonding fat with iron through heat. In non-scientific terms: when the cast-iron gets hot enough and comes into contact with fat (animal or vegetable), it will form a bond. In scientific terms this bond is called fat polymerization, I think! After all, I’m not a scientist. 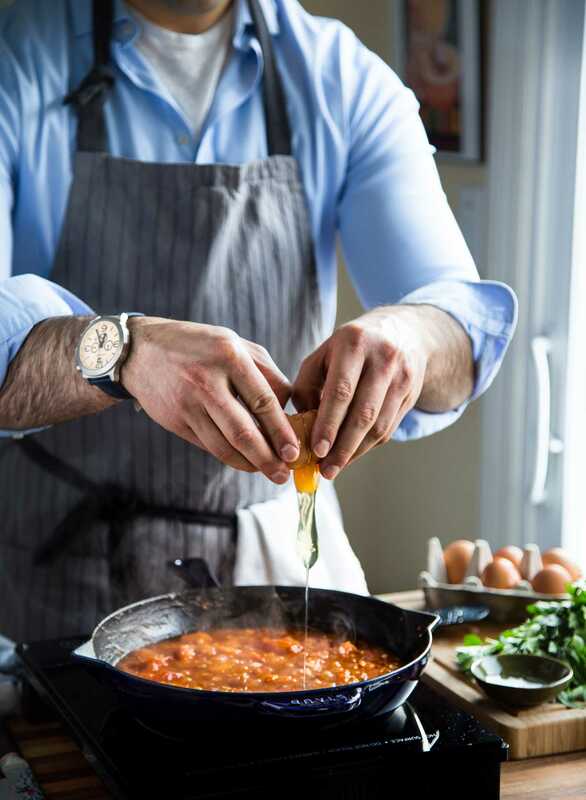 I’m just a cook and all I really care about here is making sure my expensive, organic, free-range eggs don’t stick to the bloody pan every morning! When done correctly, the bonding of the fat with the iron will produce a glossy, non-stick coating. This coating is what we call ‘seasoning’. I find it very amusing when friends call or message me asking how much salt and pepper they need to put on their cast-iron skillets to make it non-stick! 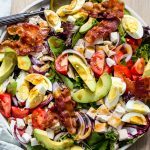 It’s one of the small pleasures I get to experience as someone with a food blog! HA! Believe it or not, there is in fact a difference between the way you should conduct an Initial Seasoning and how you should Maintain your cast-iron skillet. Most cast-iron skillets will be labeled as ‘pre-seasoned’. This DOES NOT mean you should skip an Initial Seasoning. Anyone that has tried to cook eggs on a brand-new Lodge skillet can attest to this! My guess is that companies ‘pre-season’ their products so that they do not run the risk of developing rust during transport or while sitting on the shelves. It may also be a way of convincing the buyer that they can start using the product right away. Either way, you will need to perform an Initial Seasoning. Please note, this Initial Seasoning ONLY applies to new cast-iron products (skillets, pots, griddles, etc). For restoring rusted, neglected or vintage cast-iron skillets, please see the appendix below. Place washed skillet on stovetop burner set to medium heat until skillet is bone dry. NOTE: It is very important that the skillet is dry before applying a layer of fat! 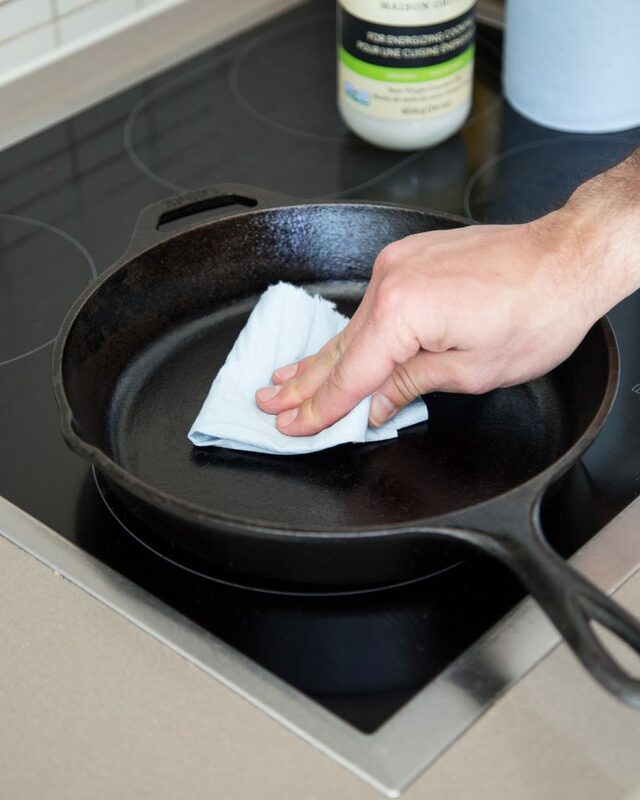 Once skillet is very dry, use a paper towel or lint-free cloth to apply a thin yet even coating of Flaxseed Oil over the inside and outside (including the handle). Keep in mind, your cast-iron skillet or pot is made from a single casting of iron. Therefore, it is essentially one piece and requires even treatment. Take a clean, dry sheet of paper towel and wipe off any excess oil. NOTE: This is the part that usually messes up your coating. Too much oil is not good and will leave you with a sticky coating. Place skillet or pot upside down on the top rack of your oven. Place a sheet of aluminum foil on the bottom rack of your oven to catch any oil drips. Heat skillet at 500F for 1 hour. Turn off the oven but leave the skillet in there until it is completely cooled. I have found this to be a very useful step in developing a great seasoning. Remove skillet from oven and repeat steps 4-7, 1-2 more times. Yes, you want to do this again. Chances are you didn’t do things perfectly the first time and a repeat seasoning won’t hurt. Now that you have seasoned your cast-iron, you can start to cook on it! The good news is that as you cook with your cast-iron, you will continue to season it. For example, when you fry bacon some of the fat will polymerize with the iron. However, your work here is not done. Cast-iron requires regular maintenance after each use. Don’t worry, it’s very easy and not as time-consuming as an initial seasoning. 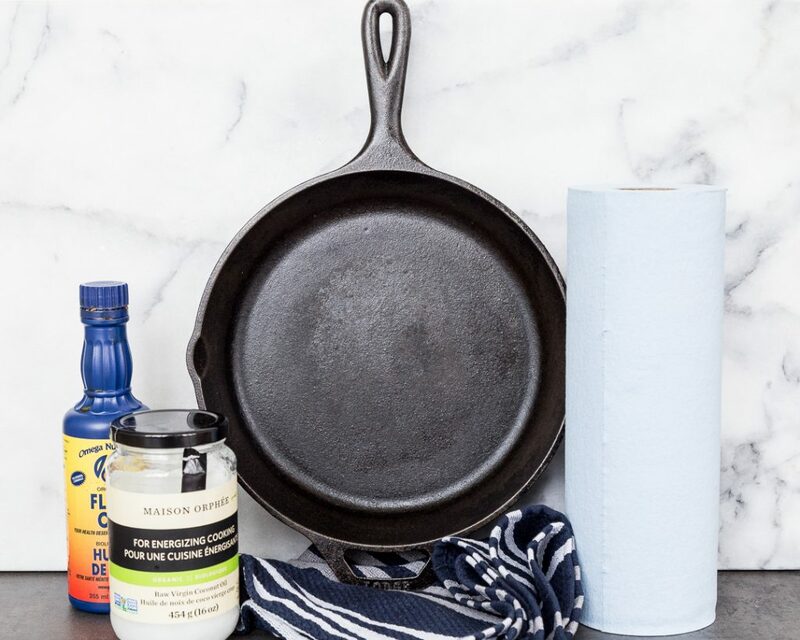 Why maintain your cast-iron skillet? Two reasons: to ensure that you maintain the non-stick surface and to prevent the iron from rusting. 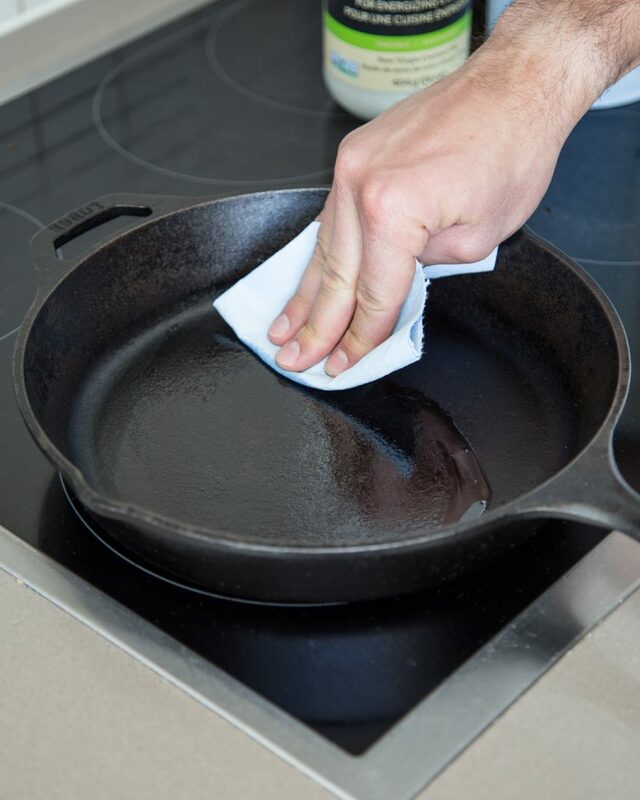 Iron rusts when it comes into contact with water and since you need to rinse your skillet after each use it is a good idea to prevent rust from occurring. 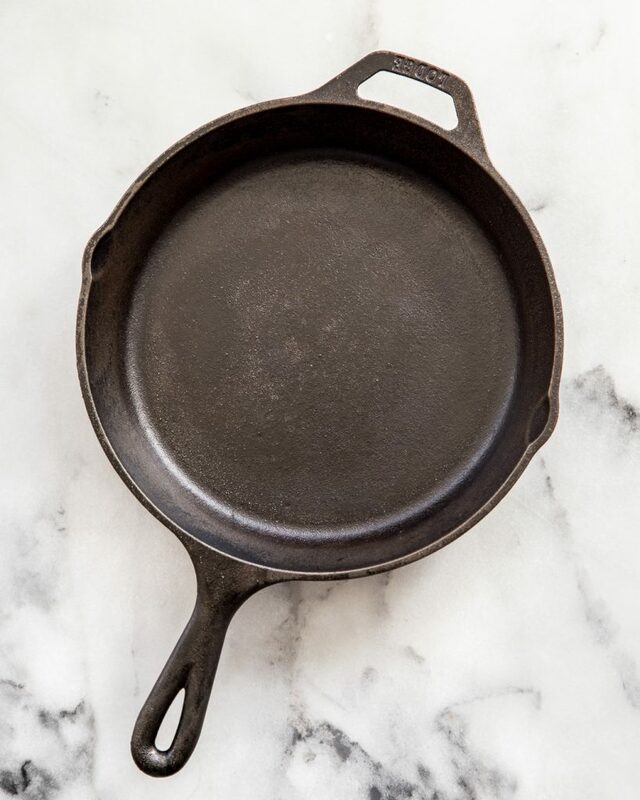 Applying a layer of ‘seasoning’ or oil will prevent rust and ensure your skillet is ready to use the next time you want to cook with it. Technically, the maintenance required is also considered ‘seasoning’ because we are performing the same fat polymerization (or bonding) as outlined in the Initial Seasoning above. However, you DO NOT need to go through all of the same steps once you’ve created a well-seasoned skillet. I, therefore, like to distinguish the two stages. After cooking, rinse cast-iron with hot water and the non-abrasive side of a non-scratch sponge. Tip: if there are stubborn bits that are proving hard to come off, try adding a tsp of coarse, kosher salt to the damp pan. This will act like a mild abrasive and help remove built-on grime. 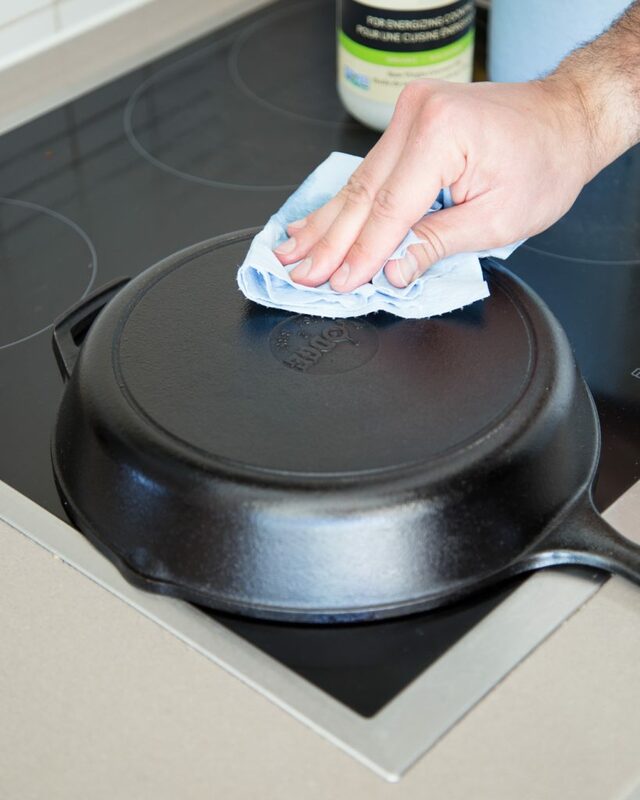 Note that scrubbing the pan excessively with an abrasive sponge can remove some areas of hard-earned seasoning. Place skillet on stovetop over med heat until thoroughly dry. 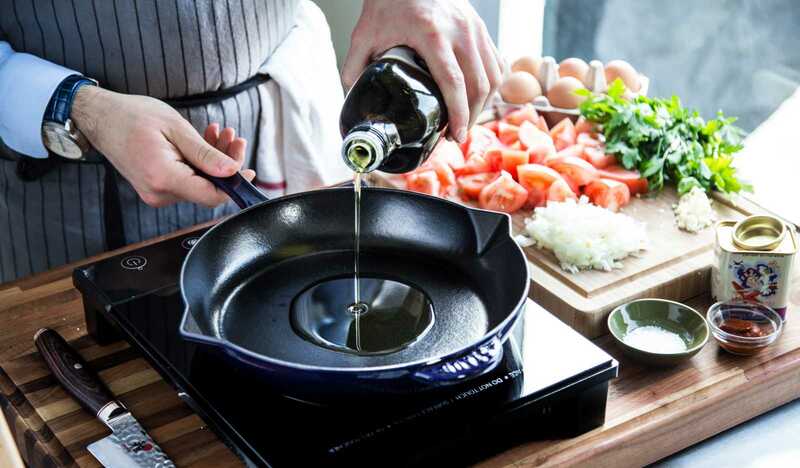 Once skillet is very dry, use a clean sheet of paper towel or lint-free cloth to apply a thin yet even coating of fat (I use avocado oil or coconut oil) over the inside and outside (including the handle). 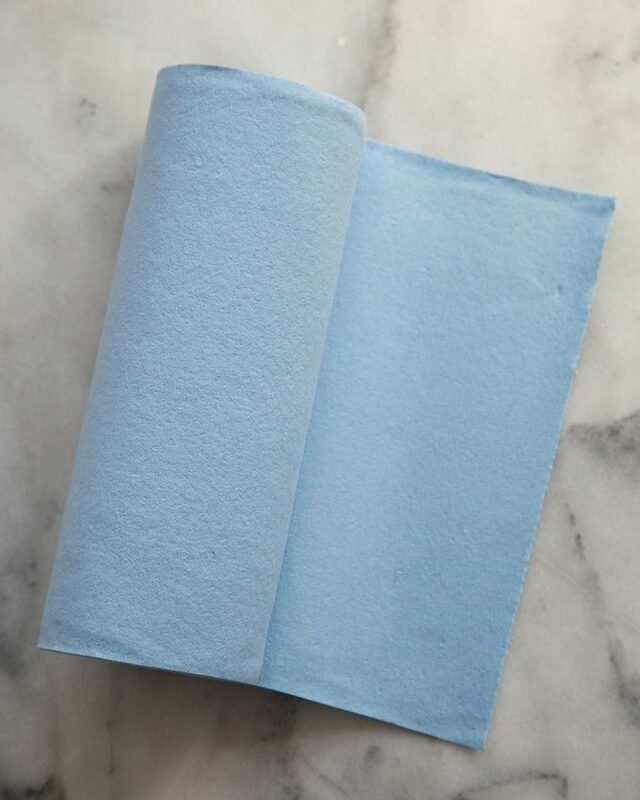 Take a new, dry sheet of paper towel and wipe off any excess oil. As with the initial seasoning, this is the part that usually messes up your coating. Too much oil is not good and will leave you with that sticky surface. Turn the stovetop heat to high and let cast-iron skillet heat up until it starts to smoke. Turn heat off and allow skillet to cool completely before storing. Note: the high heat is essential for fat polymerization and will also ensure that the oil does not turn rancid. Note: Contrary to popular belief, you can, in fact, use a small amount of mild dish soap to clean your cast-iron. What you CAN NOT do, is use a scratch scouring pad as this will surely strip your seasoning. Personally, I prefer to use a small amount of kosher salt if I have built-on grime. Unlike untreated cast-iron, enamelled cast-iron has been coated with a layer of enamel. Enamel coated cast-iron DOES NOT require seasoning. Enamelled pots and pans tend to be far more expensive than their untreated cousins, partly because they do not require the same type of maintenance and you are paying for that convenience. However, you are at the mercy of the whatever quality you purchase. In other words, you can not hope to improve the non-stick capabilities of an enamel coated skillet because it is untreatable. If you purchase a bargain enamelled cast-iron Dutch oven, that’s what you’re stuck with. Also, the downside to an enamel-coated pot or pan is that if the enamel chips, you will likely have to throw it away since it will rust and corrode. Thankfully, many manufacturers such as Staub and Le Creuset have excellent, if not lifetime, warranties on their products. 6. What Cast-Iron Pieces Do You Need? This really boils down to 1) how many people you intend to cook for on a regular basis, and 2) what kind of cooking you intend to do. As far as brands go, I have always recommended Lodge Cast-Iron products. They are inexpensive, good quality, built to last and easy to care for. They are perfectly suited to everyone from the beginner to professional chef. I’ve used mine on the grill, over a camp fire, in the oven and on the stove top. Years later it’s as good as new, if not better. I recommend getting a 10″ or 12″ Skillet. The 10″ can snuggly fit 6 chicken thighs. The 12″ is wide enough for a spatchcock chicken. In addition to the 10″ or 12″, I think everyone should have a 6″ or 8″ skillet for perfect crispy eggs. It will cost you around 10$ and might just be the best money you spend. If you’re a bit more adventurous in the kitchen you can purchase a Reversible Grill/Griddle. This is one of my favourite pieces. 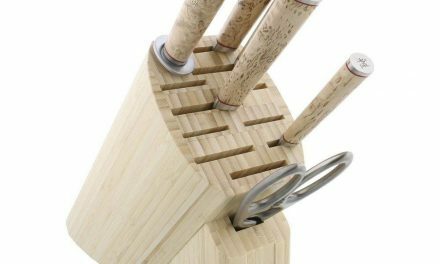 Not only is it a lot of fun to use, but it is also very functional. I use the grill side to sear large flank steaks indoors when the weather is cold. The griddle side is perfect for smashed burgers, plancha-style grilled meats, fried eggs, sautéing veggies, or pancakes, if that’s your thing. I make some mean fajitas on mine, just saying! Finex Cast-Iron makes beautifully shaped pieces with coiled handles. Expensive, but these are showpieces. Smithey Cast-Iron is an Australian company producing some gorgeous skillets. Practical and, from what I’ve heard, easy to maintain. For Initial Seasoning, I like using a flax oil. Flax oil forms a very smooth, hard, non-stick coating. Keep in mind, however, that it gives off a very strong odour when heated so be sure to turn on your fan and open all of the windows. I use this Flax Oil. I’m sure others work just as well. 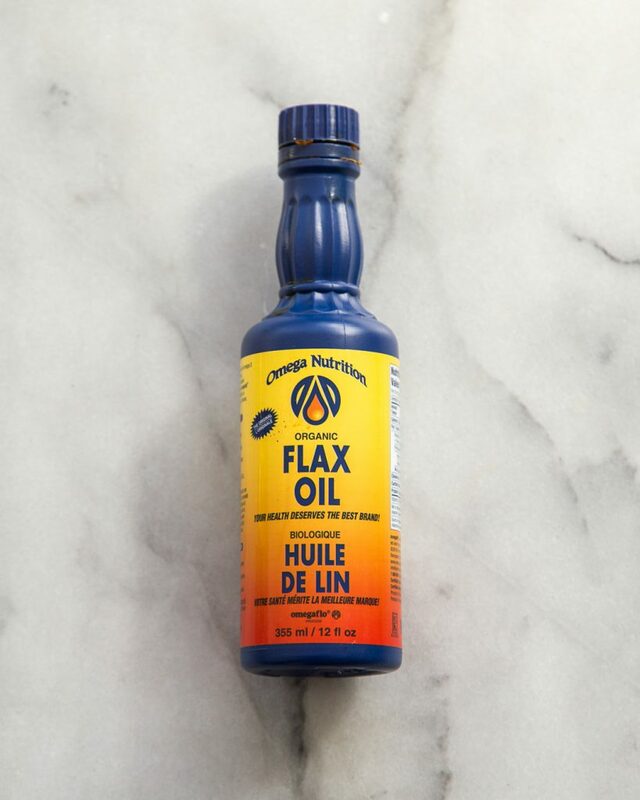 Keep in mind, you don’t necessarily need an expensive flax oil. You are going to heat it to the point where it bonds with the iron so I think it is fair to say that any nutritional properties will be lost. 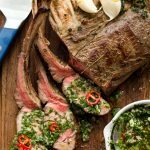 My friend, Jeffrey B. Rogers, from theculinaryfanatic.com, has mentioned that he does not like to use flax oil to season cast-iron because it provides inconsistent results. His preferred seasoning fat of choice is Crisco and by the look of his immaculate collection it is safe to say that he knows how to perfectly season a cast-iron skillet. Though I greatly value Jeffrey’s opinion and am proud to call him a friend, I tend to gravitate towards the healthier fats even if it means a less consistent, polished surface on my skillets. One thing that Jeffrey is absolutely right about is using Scott Shop Towel Rolls. 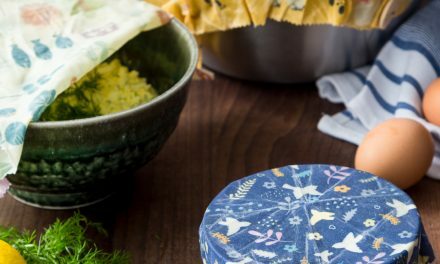 Unlike regular paper towels, these are almost entirely lint-free and far more durable. You can purchase on Amazon or try finding them them at your local Walmart or hardware stores. They have a neutral flavour and high smoking point, which make them ideal candidates for maintenance. They form a great, hard bond (polymerization). I buy them in large format for a relatively good price at Costco (about 14$ per 1L bottle for avocado oil). I also use these fats for most of my cooking so it reduces the amount of products I keep in my pantry. As an aside, I think avocado oil and coconut oil are also great for anyone who continues to use far too much oil when seasoning their cast-iron. These are both relatively expensive fats and I promise, if you use them you will be reminded of how much money you’re pouring down the drain when you apply too much. Remember, you need very, very little oil for maintenance seasonings. Having said that, you can use any neutral, high-smoking point oil or fat (animal lard or vegetable shortening are often suggested). There are, of course, different levels of rust and corrosion. For mild rust, simply follow the steps outlined above for How To Initially Season Cast-Iron using steel wool rather than a scour pad. The steel wool will strip most of the surface-level rust. 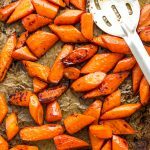 You will likely need to perform the Initial Seasoning 3-4 times before it is brought back to its former glory. The important thing to know is you can in fact bring it back to life with a bit of TLC and a lot of elbow grease. 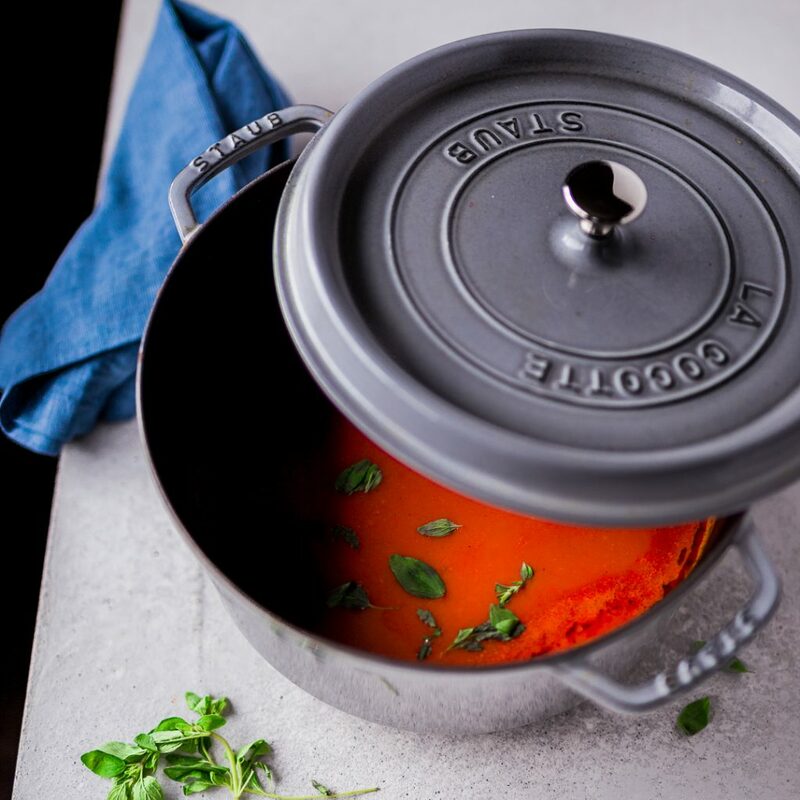 If you have found a very neglected or vintage piece of cast-iron cookware that is heavily rusted, you may need to first bake the skillets at 500F for around 2 hours in order to help remove the surface grime and buildup. Then you will need to perform the above steps outlined for How to Initially Season Cast-Iron. If that doesn’t work, you may need to find someone with an electrolysis tank. I hope you find the above information helpful. It’s worked for me and I think it will work for you as well! This is so helpful! Will be bringing my cast iron skillets back to their former glory this evening. Very glad you found it useful! Thank you so much for this helpful information!! I follow you on Instagram and have learned so much!! I recently purchased my first cast iron skillet and I’m so excited to get started!! My local store does not carry flaxseed oil. 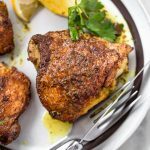 Could I use coconut oil or avocado oil for my initial seasoning? You can definitely give it a shot. I would think that the surface may not harden as much as flax but this might be compensated for by a couple extra seasonings. Thank yoy so much for this. Off I go to season my new cast iron skillets. Very happy you found it useful! I have done one round of seasoning. More to follow. I did it at 500F. Things I noticed – there was a strong smell in my kitchen. I noticed that there was wisps of smoke in my oven and escaping through one of the stove burners. Is the smell and smoke common? I panicked and I watched the oven for the whole hour. Help!! I followed these directions but when I put my skillet in the oven the house filled with smoke. I’m not sure this is supposed to happen… smoke irritated my eyes and throat. Can you tell me if I did something wrong or is this actually what is expected? Hi Salena, sounds like you applied a bit too much oil and didn’t wipe off the excess. That oil may have then dripped onto the bottom of your oven and started to smoke. Be sure to wipe off as much oil from the pan as possible before placing it in the oven to season.